VIP Girl is an Asian makeup brand which is currently leaving the Etude House online collection. I'm sad to see it go, however I thought I would do a final goodbye on one last post. You can really only find these products now on Ebay, and even that is a bit scarce. The VIP Girl line is filled with neon pinks, and bright colors. I really like the packaging too, although it is a bit child like, oh well! 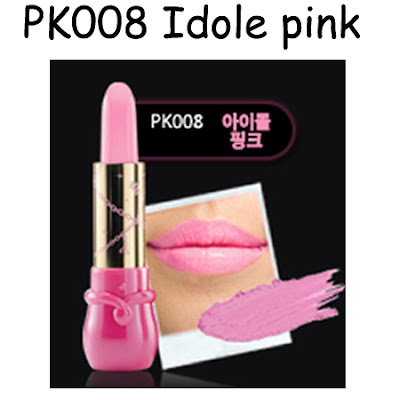 I bought VVip Pink and Idole Pink, both are a little on the wild side. One is a bit more lavendar, while the other is a bright barbie pink. Both are a little harsh on the lips, a moisturizer is needed with these. I actually find they mix better with other lipsticks to create a more neutral look. aww are they going to be discontinued? i have the pk007 shade which is very bright for me, i don't wear it that much though.